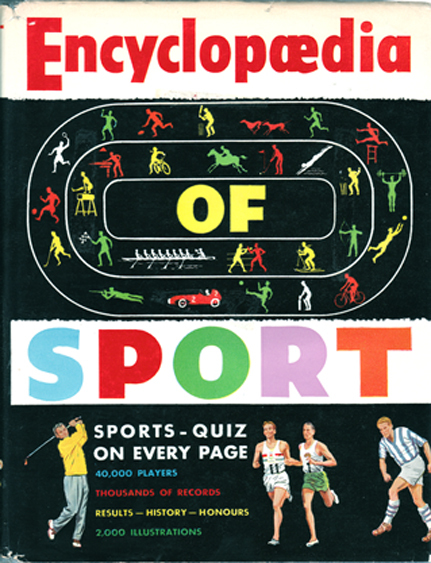 Encyclopædia of Sport – Charles Harvey, et al. Author: Charles Harvey, et al. Description: A better title for this scarce encyclopædia would be the Bible of Sport. Every conceivable sport is covered within its 320 pages. Even the more obscure sports, such as pigeon racing and coursing, are supplied with detailed entries. All records (world and personal) are supplied for each of the sports, as well as the results of each major tournament. There are also quizzes on each sport to test the knowledge of enthusiasts (complete with answers at the back). 2,000 illustrations in the form of Spark's excellent caricatures, plus b&w photographs and b&w reproductions of club badges. The pastedowns and endpapers depict the logos and devices of each sport's governing body in two-tone monochrome. As is visible on the image, the jacket has slight tears on the top and bottom-left corners. It also has the remains of 4 adhesive mounts (most probably where the previous owner had mounted their ex-libris). Other than that, it is in good condition and hasn't been price-clipped (12s. 6d.). The pages are lightly tanned and are overall in very good condition. The only flaws are a negligible stain on the title page, and some grubby marks from handling on the last few pages. Other than that, they are completely free from any markings or foxing. An absolute must for the sports buff. Measures 28 cm × 21.5 cm (11.2″ × 8.6″). 4to. 328 pp.